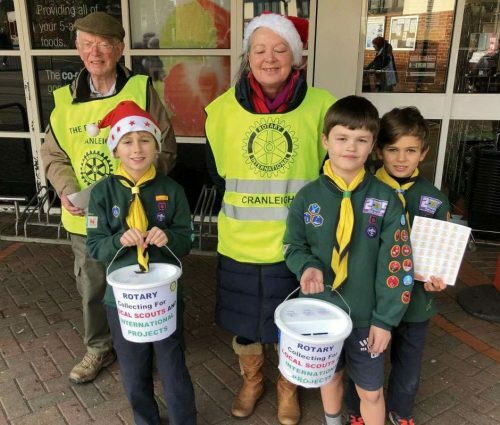 This year’s street collection by members of Cranleigh Rotary in the days before Christmas was a great success, raising more than £1,700 for various organisations and charities. “We had a wonderful three days, very successful in lots of different ways,” said Rotarian Jane Briggs, one of the lead organisers. “Raising a total of just over £1,700, we collected £760 of that on the Saturday in just four hours! 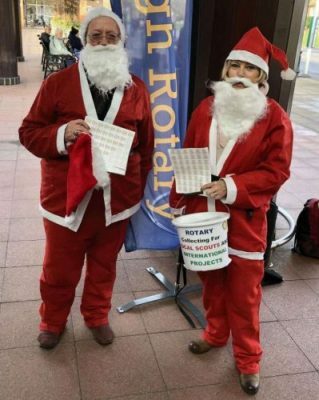 Rotarians often wore Santa hats, or, in some cases, full outfits, and on Saturday we had lots of help from the Scouts. Over £1,200 from the Santa Dash that will be used to provide books and other equipment for local primary schools. 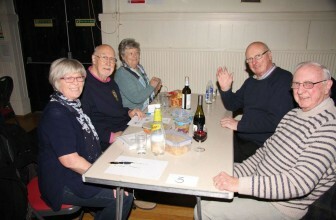 More than £1,000 for Cranleigh Scouts. In addition, the Cranleigh Club has once again joined St Nicolas Church to conduct the Christmas Shoe Box Appeal for deprived Romanian children. The Club also paid £1,180 for two ShelterBoxes to be sent to the site of the disaster caused by the huge earthquake and tsunami that struck in Indonesia at the end of September. Cranleigh Rotarian James Phiri continues to spearhead a number of development efforts in Zambia. These include delivery of medical supplies and equipment to the remote Chilubi Island Health Centre; fundraising for the Virtual Doctors Project; and efforts to proceed with the Rotary Eye Hospital and Rotary Jaipur Limb project. James has also delivered thousands of pens – provided by Rushmoor Rotary Club – to disadvantaged pupils in Kenya and Zambia. Back JUST DO IT! No time like the present . . .